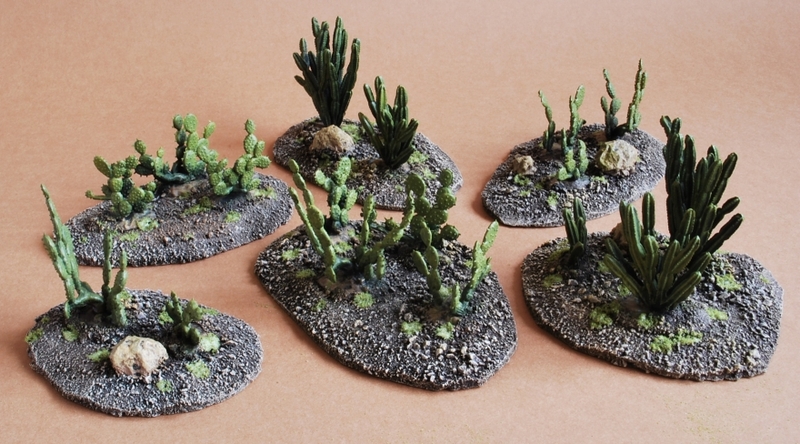 MiniKingdom: Pegasus Hobbies Large Cactus as 32mm scatter scenery. 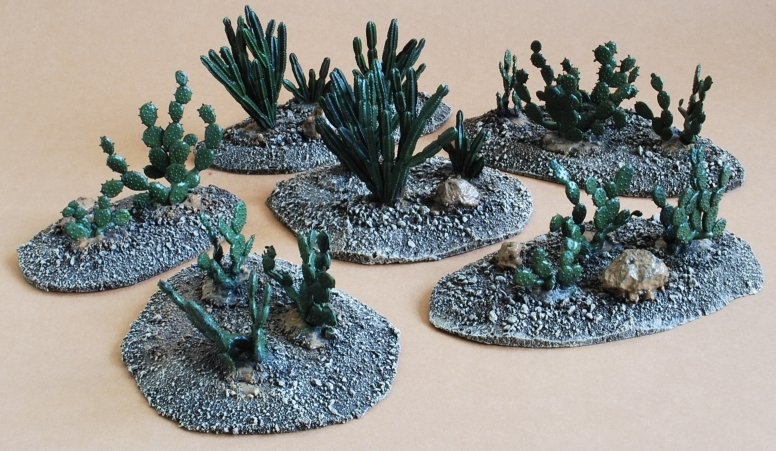 Pegasus Hobbies Large Cactus as 32mm scatter scenery. 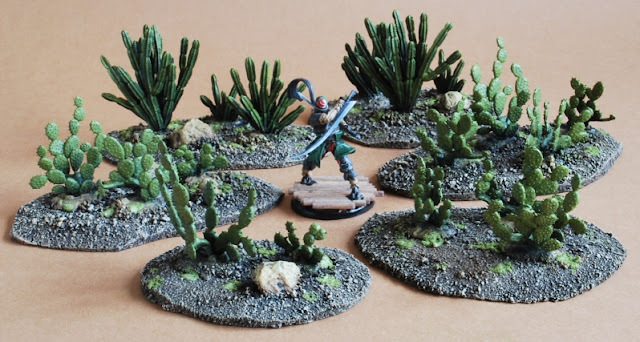 So, I was hunting for available scenery kits and components that would fit the Malifaux themes well. Suffice to say there is not a lot out there to fit the scale and themes perfectly. 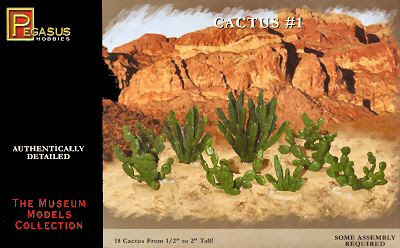 So I grabbed this box made by Pegasus Hobbies, while not specifically scaled they have a 'large' and a 'small' Cactus set. 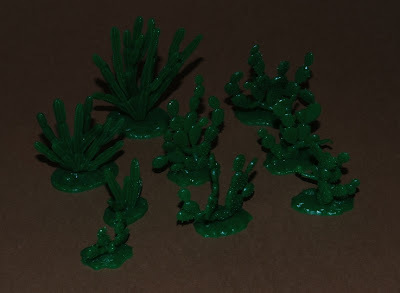 This is the large set whose description has the models ranging up to 2" tall. Inexpensive boxed set (courtesy of modelhobbies.co.uk, well recommended for there speed and reliability ). 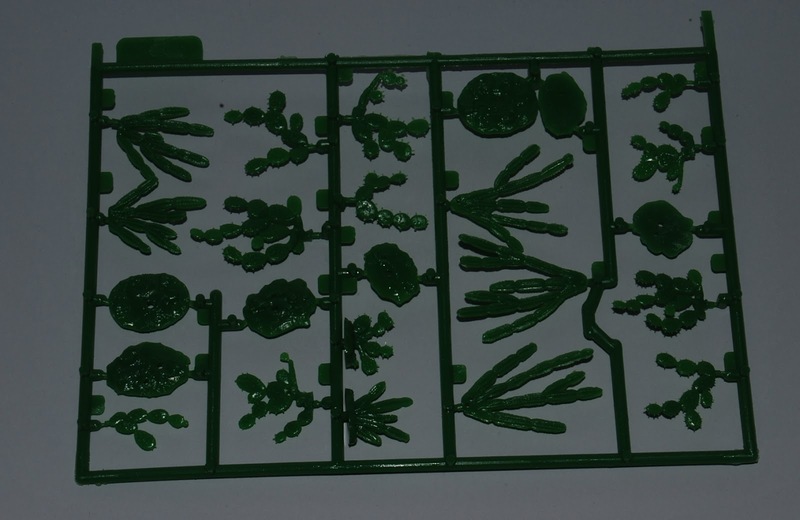 In the box you'll find two of these sprue in delightful green plastic. Each sprue will build up these nine Cacti. They fit well on their stands and the components are all numbered accordingly. Bases cut from cork tile. With a generous and relatively densely packed quota on each base I produced six decent sized scatter pieces. All secured with some hot glue gun action, together with a few small rocks for interest. No problems with primer (GW black), and away with painting. Usual light browns for dry brushing and some sandy colours for the rocks. Little flock for more interest and bam. For scale this is a 32mm Malifaux Torekage. 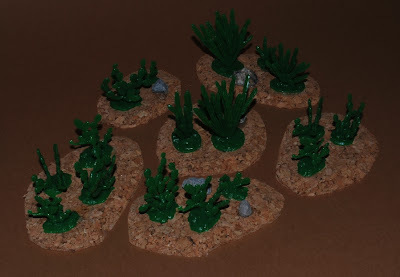 For Malifaux the pieces easily average out at Ht 2. For conclusion, this is a decent kit with well detailed and distinctive models. They fit together well, but lack instruction and the larger 3 piece Cacti will be a case of trial and error to fit correctly. Naturally the components could be distributed to cover a large area, and I think this kit would also be perfect for detailing any piece of desert themed scenery or even bases. Some of the very smallest extremities are prone to bending or snapping, but these can be removed unnoticeably. 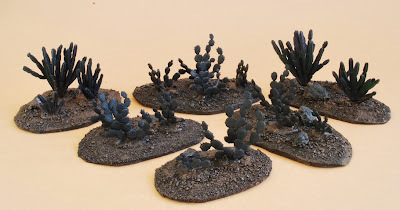 The plastic on the whole is sturdy enough, the flat shaped Cacti will bend under handling and painting but will not deform at all. The small scale plastic Cactus market may be limited but this kit is certainly worth a purchase regardless for any wild west, desert themed gaming.